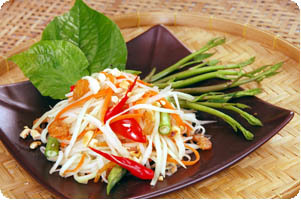 Sliced Green papaya 5 cup. Grape or cherry tomato* 5 pcs. Tiparos Fish sauce 3 tbsp. Red Thai Chilli 3 pcs. Palm or coconut sugar 1 tbsp. Low fat and calories. Adequate fibers. All ingredients are available at our store.